It's a funny thing what can happen when a bunch of individual people fed up with the way things are can find their voice together. To delve into the realm of politics as little as humanly possible, the recent New Hampshire primary showed how people fed up with the status quo could make their voices heard. And in the NHL, it was a vote that started the ball rolling on a huge, twisted series of events. The fans wanted to voice their displeasure with the NHL, and voice it they did. They chose John Scott as an unlikely avenue to protest the league, voting for him to appear in the All Star Game early and often, to the point that he was he highest vote getter in the league. And the NHL allowed it to happen. Sure, the NHL tried everything in their power to prevent Scott from going, including shameful tactics that used his daughters as ammunition, but they ultimately allowed it when they announced that he won the fan vote. The league knew that the vote was a joke, they knew it was done with the intention of making the league look bad, and despite it all they didn't put a stop to it. It's not like they hadn't faced a similar situation before. During the 2006-07 season, a fan campaign to vote Rory Fitzpatrick into the All-Star Game failed under dubious circumstances, and this wasn't even an attempt to mock the league. The idea was started as a way to honor the players who put in the hard work behind the scenes yet didn't get the recognition. Maybe the league wanted to avoid a similar backlash, but whatever the reason this time around the fans spoke up and forced the league to listen. They spoke up by voting Scott into the All Star Game in the first place. They spoke up when Scott was traded to Montreal and demoted to the AHL, which the league used as their excuse to bar him from attending. And they spoke up again when Scott's two goals still weren't enough for the league to put him on the MVP ballot. The fans forced the league's hand and Scott won the award. What started as a means of making the league look bad morphed into an outcry over the poor way the league was handling the situation, but the common denominator was the voice of the fans getting things done. 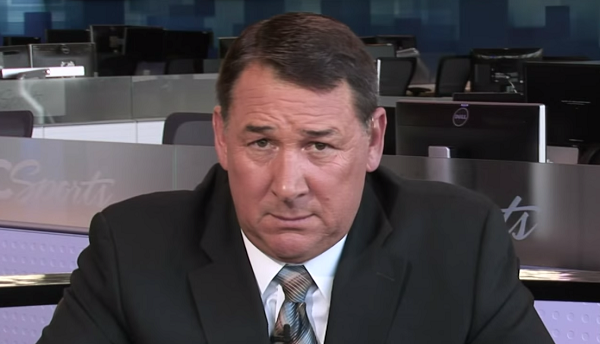 "Former NHL player, coach, general manager and current NBC Sports Network desk analyst Mike Milbury has proved time in and time out that he is unfit to do his job properly. His rude and demeaning matter has not only made many of the NBCSN Intermission reports significantly less enjoyable but has also caused many of the fans to call for a change, something that NBC has failed to do. Many believe he is a disgrace to the sport of hockey everywhere and he has proved it once again during the 2016 NHL All Star Weekend. Milbury has said several incredibly disrespectful comments regarding the fan voted captain for the Pacific Division, John Scott. No player no matter what the circumstances should blatantly be made fun of, especially a fan voted player during the All Star Weekend, a weekend said to be for the fans. Additionally Scott has been a positive influence for the players and fans throughout the weekend and is a clear fan favorite, only to be demeaned by Mike Milbury's spineless and bad-mannered comments. These comments do not only affect John Scott but each and every fan who passionately voted to see him play. Scott has fans, friends, family, teammates and all the players by his side rooting for him all the way and closely watching only to have Mike Milbury de-escalate everyone's high spirits and good times. Please do the fans, players, media personalities and John Scott a favor by signing this petition to remove the embarrassment that is Mike Milbury from NBC Sports Network entirely, thank you." The petition currently has gathered nearly 13,800 signatures. It's unlikely to succeed, because NBC knows that Mike Milbury will draw in viewers simply because people will react to what he says and hate him for it. But if the league has learned anything in the aftermath of the John Scott/All Star Game situation, it's that the fans are capable of stepping up and making their voice heard. Sooner or later, Milbury will say something that will truly embarrass the league, and possibly even the network, and the backlash will make them wish they put their foot down sooner.